I’ve already talked about cheap ways to have a good date. But, I know it’s a popular topic with you guys – having a date is hard without breaking the bank. First you think you need a sitter – then you go out to eat – then you perhaps go to a movie (or the grocery, which is MORE expensive. Ha!). I’m partnering up with The Grocery Shrink and a few other bloggers to give you some great ideas for frugal dates. 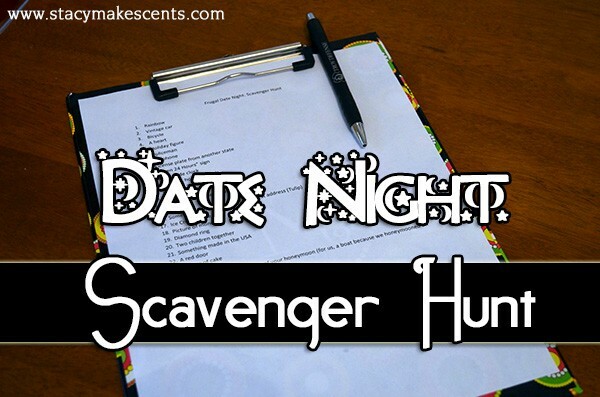 Today is my post – Date Night Scavenger Hunt. Having fun doesn’t have to cost an arm and a leg – usually the best fun is FREE. 🙂 You can quote me on that. 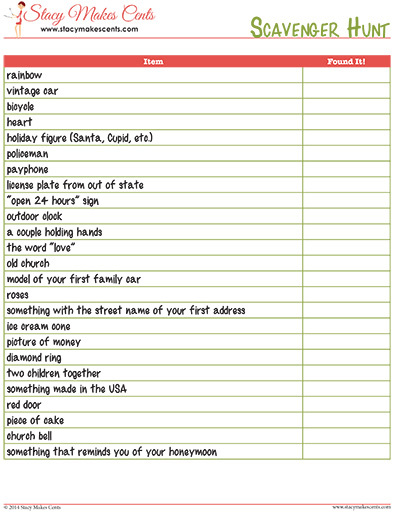 Barry and I worked together to create this Scavenger Hunt list. Barry made it into a lovely printable PDF for you, because he’s awesome like that. 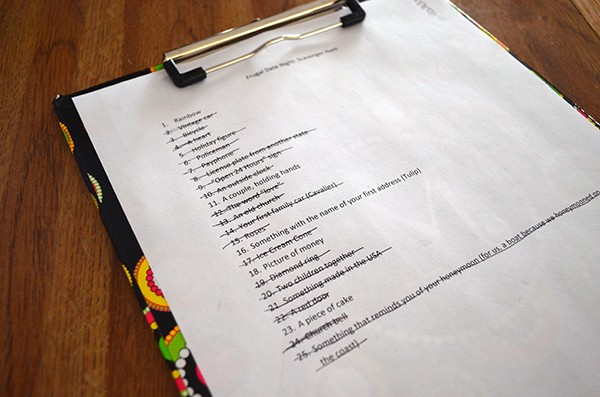 Now I’m making your date night even easier – you don’t have to make your own list. Boom. No excuses…I’m fixing to put an end to all of them right now. Date your husband/wife. You work hard to get them…now let’s work hard to keep them. Oops. I’m not sure if I’m supposed to say that or not. Oh well. First, you need to decide where you want to go. This might revolve around eating plans – it usually does for us because I spend most of my day thinking about food. It’s a big deal to me. For me, date night is all about the food. Honesty is the best policy. We knew we wanted to go to the city because Chick-Fil-A was calling me. Don’t be hatin’. So, just decide where you think it would be best for you to find the items on the list. Hint – a nice country drive in the woods isn’t going to make it very easy to find a phone booth or an outdoor clock. Next, you need someone to keep your children (this only applies to those with children). Babysitters are an expensive option. I have no issue with hiring a babysitter if you can afford it. But, remember this is called a FRUGAL DATE NIGHT. Shelling out $50 for a babysitter isn’t on my list of frugal activities. You can try making arrangements with your friends for date night switching. You keep their kids, they keep yours. Obviously NOT at the same time – that wouldn’t work well at all. We are very blessed to have family that lives close. 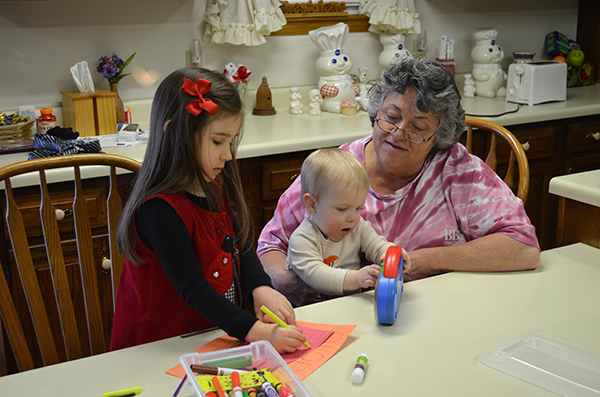 So, Mamaw was the ticket for our Saturday lunch date. Bless you, Mamaw Chestalene. Plan your date for good weather. Obviously our weather man did NOT get the memo. 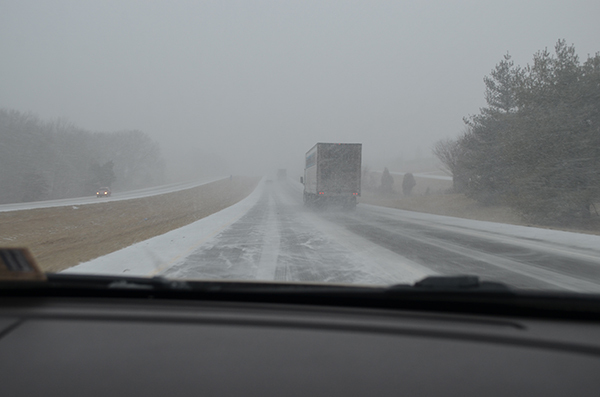 We left the house in flurries – then there was a FREAKISH SNOW STORM in which we literally slid down the exit ramp. Oops? I always pick the best days for dates. I’m also excellent at choosing awesome movies (NOT). Our date went on! We visited Chick-Fil-A for lunch…this was a freebie for us. Not only did we have coupons, but we got a gift card for Christmas so that took care of our bill. Nice! TIP: If you have a gift card, use that to center your date around. If eating out isn’t an option for you, pack a lunch for the car. I can’t tell you how many times we’ve eaten sandwiches in the car. And you ARE on a scavenger hunt – so being in the car and looking around is kinda important. We did most of our looking around during our drive and our time at lunch. Because of the FREAKISH SNOW STORM a lot of the businesses closed – but we managed to find an antique store that was open (but without heat so we froze our buns off). 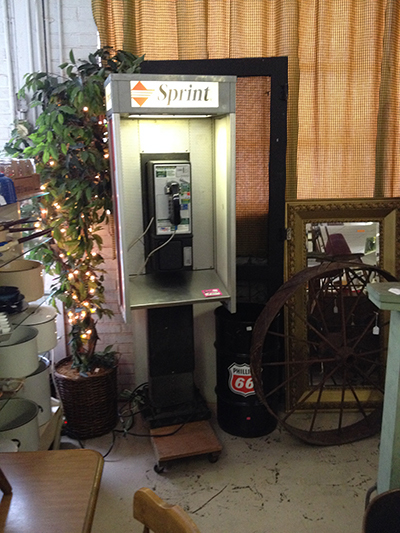 Antique stores are GREAT for scavenger hunts – because you can find random old stuff (including phone booths) for sale. We had a lot of fun on this date – which only cost us gas money (and $18 because I found another vintage Raggedy Ann and some jars at the antique store). This is a super frugal date night idea. I hope you enjoy it and find the PDF helpful! As you can see, we didn’t check everything off our list because of the FREAKISH SNOW STORM – but we did have fun…and we did stay alive. I think that’s a winning situation right there. If you check everything off your list, then consider yourselves winners. Give each other a nice foot rub. Or something else…if you catch my drift. Hey, it IS a date night after all. Ahem. I’m partnering together with two other bloggers to explore frugal dates! Make sure to check out Jenna at Rain on a Tin Roof where she is sharing a Fast and Frugal Valentine Tablescape and then hop on over to hear Angela from The Grocery Shrink give you 25 Ways to Date Your Mate! Featuring you at Family Fun Friday! http://www.happyandblessedhome.com/2014/02/family-fun-friday-week-58-100-date-night-ideas Thanks for all the great ideas! So creative! I think my husband would give up and just text me that he was going to stay home, though… lol! Great idea! We would have fun with this. Thanks for sharing it on the A Round Tuit Linky. Hey your cheap ways to have a good date link is broken. thanks Stacy, this will be fun to try. My husband and I went on a date on Saturday and it was a bomb, please don’t confuse this with DA BOMB! Nope it was BAD! We went to this restaurant that said they had grass fed burgers, wow! I ordered mine med rare and what was served to me was a char broiled mess on a bun with little else for a hefty chunk a change, we live in NY, ya know. We took the Date Night Challenge from Focus on the Family – go on three dates in 3 weeks and then commit to one date per month. That is a lot of going out in a month, yikes on the budget! I am a home body and really just want to stay home when it is dark and below 20 degrees. So maybe next time we will eat a sandwich in the car and then try your scavenger hunt, thanks again. The important thing is that we had fun together and both just really wanted to go home. I love this idea and am using it for our next date night, whenever that is! My husband and I don’t get out together much these days. Between his swing shift work, the kids, my work from home job, hunting season (thankfully that’s done this weekend), other obligations and tight finances, it feels like we only have a couple of hours a week to see each other. By that time, we’re pooped. When we do have a chance for a date, which is helped along by a supportive and understanding family member, we like to be able to relax without concern over the cost, and enjoy it together. I think this, along with a gift card we got at Christmas to a local restaurant, will be fabulous! The hard part is figuring out when we can go! Hmmmm, March or April? Thank you! Around here, you never can tell – weather is so fickle.